I’ve been inspired by Chris Townsend’s wonderful photos and descriptions of his recent walk through Death Valley to recall my own pathetic attempt to get there in 2002. I leave Santa Monica on I-405 going north. It’s no time at all before you’re in the mountains and Los Angeles feels like it’s a million miles behind. In fact, we’re not so far away — we’re simply curving round to the next part of LA and pretty soon we’ll be at the Ventura Freeway. It’s 6am, approaching dawn, very misty/ smoggy, with tiny patches of blue just starting to appear. On the freeway it’s madness. The lanes change all the time, getting wider, narrower, merging, disappearing — terror — speed — carpool lane — cars coming up on the right and suddenly leaving on the left and it’s probably not a good idea to try to speak into a voice recorder when you’re travelling at 65 mph in the middle of five lanes. I throw the gadget into the passenger seat, grip the wheel firmly with two hands, and determine to just try to remember all of this without an electronic aid, but soon I’ve picked up the machine again. I want to remember this trip as accurately as possible. This is ~reality~. Ten miles out of Santa Monica and the freeway is starting to clear on my side but over on the left, going into the city, the traffic is at a standstill. We’re now at the junction with Route 118 going to Simi Valley, but I’m carrying on along I-5, heading north to join the 14. Then suddenly a sign says the 405 merges with the 5 but it doesn’t it, turns into the 5, and then it opens up abruptly and there’s the 14 so now we have three lanes for the 14, three lanes plus the carpool lane for the 5, bloody roads going all over the place. Arg! Somehow I manage to get over onto 14 without dying. Now it’s getting light and the sandy mountains are much more visible although it’s still quite misty. I feel as if I am in some science fiction land with all these concrete flyovers in the middle of an otherwise empty and mountainous desert and ahead of me rows and rows and rows of white lights from all the cars heading into LA and just a few lines of red tail lights leaving the city with me. The road proceeds into the San Fernando Valley — now it’s a broad highway with five lanes and a carpool lane, and soon we’re in Sand Cañon, which indeed seems to be just a huge basin of — sand. A depression of sand ridged by mountains of sand. The ridges and furrows and pipelines and machinery are evidence that the whole area is being hollowed out. Grain by grain the entire valley is being removed and some of it is hitchhiking a ride in the air- conditioning system of my car — I can feel it in my nose and throat. The light’s just starting to come up and everything’s kind of pale. Beyond the sand hills the mountains are enormous and the sun is just filtering through the gaps spraying a gentle white light across mountains that get higher and higher as they recede. Next, Escondido Cañon. No more sand and sun — now we are in thick fog and slowed to a crawl. I can barely see the tail-lights of the car in front. How can weather change so fast between one cañon and the next? As the fog clears I see a valley strung with power lines, each mountain connected to the next with a cat’s cradle of cables and pylons. And now Palmdale and everything is blue and pink and sunny and bright, the road is lighting up and at last I feel the warmth of the sun on my face as we pass over the California Aqueduct, a ribbon of water running over 200 miles from Mono Lake down to LA. At 7.45am I pull up outside Krispy Kreme in Palmdale. I’ve been warned that after this town “there’ll be nowhere you’d want to stop and eat for over a hundred miles” so it’s breakfast now or never. I’ve come here in the hope of a traditional American breakfast of bacon, pancakes, syrup and all the trimmings, but this small mall offers only a choice of three fast food restaurants — Jack- in-the-Box, Wiener Schnitzel, or KK. Actually, I’m being just a tad untruthful because there’s also a Marriott Courtyard where I could order a full breakfast but after wandering into the foyer sticky from the car I feel uncomfortable in its business-like corporateness, so I sneak out again before the waiter approaches, and make my way across the parking lot. It’s clean and pleasant in Krispy Kreme, but mostly all you can get is coffee and doughnuts. I’ve always resisted the American doughnut breakfast but what can I do? Take the risk of getting back on the freeway and being rewarded with an IHOP at the next turnoff, or finding nothing save a rattlesnake- infested diner at the edge of the road? I choose a chocolate crème-filled and a cinnamon apple-filled — but will this be enough to power me through 100 miles of desert? I add a sour crème only to discover that this entitles me to a free fourth, so now I have a maple as well. Since I ask to eat them here, they arrive neatly set out on waxed paper on a clean brown plastic tray. I choose a window with a view out in the direction of Route 14, beyond which the mountains rise with their mohicans of pylons. Over to the west, towards the coast, there are some large white clouds, but the rest of the sky is relentlessly blue. Beyond the window, large black birds, rather like ravens, cling to the trunks of palm trees and peck at the insects within. Krispy Kreme chocolate crème doughnuts are no comparison to their sister the Dunkin Donuts Boston Crème. Instead of yellow vanilla custard they are filled with white buttery icing. I feel slightly sick. I’ve managed three but the free maple still sits there. I just can’t do it. I’ll get a bag, another latte for the car, and be on my way. It’s past 8am and the sun is starting to get hot. Why is it that Americans are so good at telling you what to do and where to go (see Customs and Immigration for typical examples) but they are so useless at road signage? I will never forget Rancho Vista Boulevard as the street I drove up and down four times before finding a tiny turn-off to the left, directing me to 14 and the Mojave. You really would think that in a place like Palmdale where almost all the planning is brand new they would have got it right for once. Oh well. Back on the road, I pass the Edwards Airforce Base, then out again into empty space. But not really so empty. One imagines that the desert is very still but actually it’s extremely windy here and over to the west I see hundreds of spinning blades which turn out to be a giant windfarm. Then a sign saying Welcome to Mojave — ah, the wilderness at last! — right next to a disposal site and an extremely long train carrying tankers of god- knows-what. 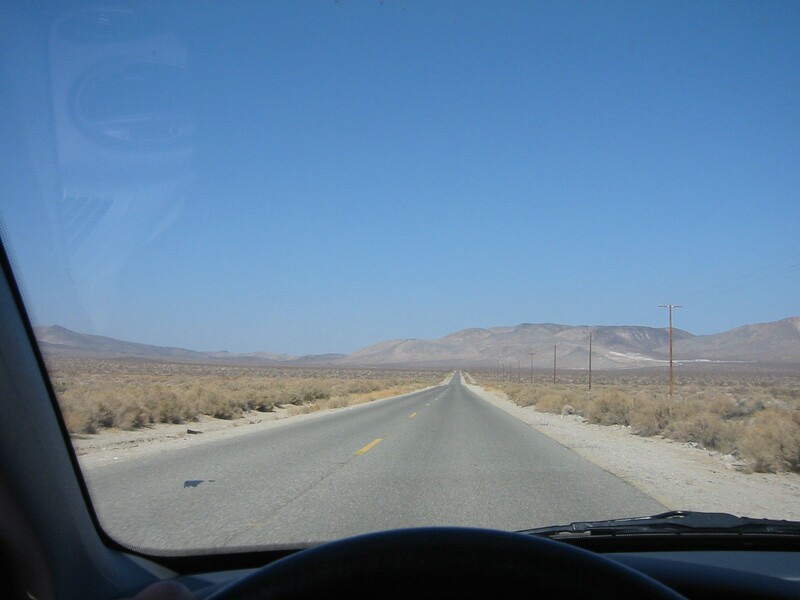 We pass through the town of Mojave itself and reach a junction — Bakersfield to the west, Death Valley to the east. A road sign instructs drivers to turn on their headlights for the next 8 miles, presumably to avert the glare of the high desert. This is the road I had looked forward to, a wide open vista ahead. Ridgecrest is populated with 27,500 independent, self-reliant people who value old- fashioned principles and tend to be highly-educated, scientific and technologically- oriented. In other words, they are all retirees from the bases at China Lake and Edwards. This is small town America in the raw. Or perhaps in tooth and claw. I don’t plan to stay long enough to find out. Back on the road, I head for Trona, followed by a gigantic silver truck whose looming presence in my rear view mirror reminds me ominously of Spielberg’s debut film Duel. In all my hopes for driving along an open road like this I had always imagined the radio would be playing ZZ Top — but the only station I can find offers Engelbert Humperdink’s Please Release Me. Another favourite fantasy shot to pieces. But there is worse. I have to keep re-tuning, and eventually all I can get is some Nevada station with a diatribe against gay marriage. ‘Vote Yes on < couldn’t make it out >’ But whatever the Yes vote means, it isn’t well- disposed towards homosexuality, that’s for sure. In Trona I stop and take some photos of myself standing next to the car. I’m sun-burned and squinting against the light. 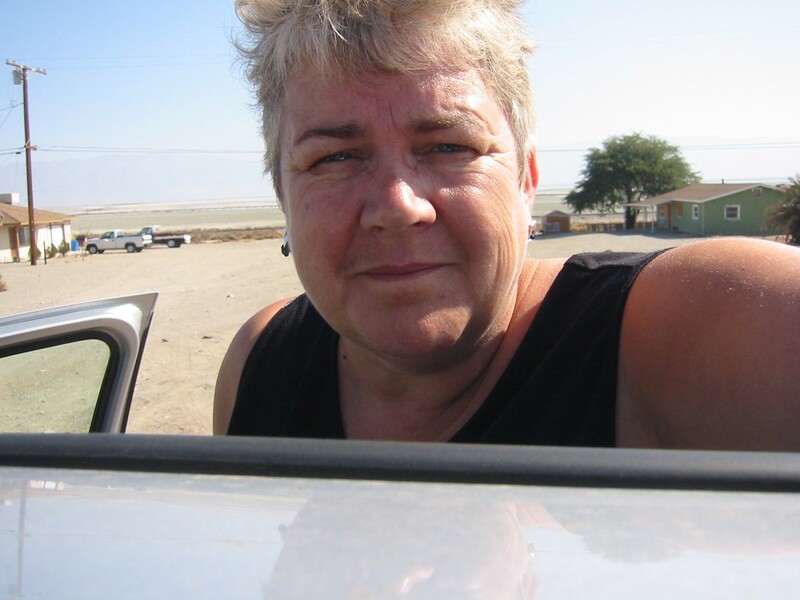 Behind me, the flat desert floor is white with potash — the whole place is an enormous open-cast mine. Most of the houses are nothing more than derelict shacks. The gas station is falling down and uninhabited. At this moment, even a Krispy Kreme restaurant would seem like civilisation. I remember Kalgoorlie and for a fleeting minute feel a pang of regret for the way I had taken against it two years earlier — it may have been crass and exploitative but at least it had a smile on its face. The face of Trona is blank and ghostly pale. After Trona, the road suddenly becomes terrifying. One moment I am on a reasonably flat minor highway and the next I’m driving along the top of a mountain and below me a narrow and unbelievably steep road winds its way down to a flat mesa which I will later discover is the Panamint Desert. At this point, I believe I am descending into Death Valley. Wrong. Nowhere near it. For the first time, I’m frightened by the prospect of driving and to make matters worse, my knees have now turned to jelly. I can’t guarantee that I can manage the controls. My knuckles are white on the steering wheel. Why had I not expected this? Why had it not occurred to me that if I went to the mountains I would have to do mountain driving? Am I that unrealistic? It seems like I am. There is nowhere to go but onwards. With the windows closed against the desert wind and my eyes squinting against the glare, I continue doggedly. Past the turn-off to Ballarat Ghost Town (pop. 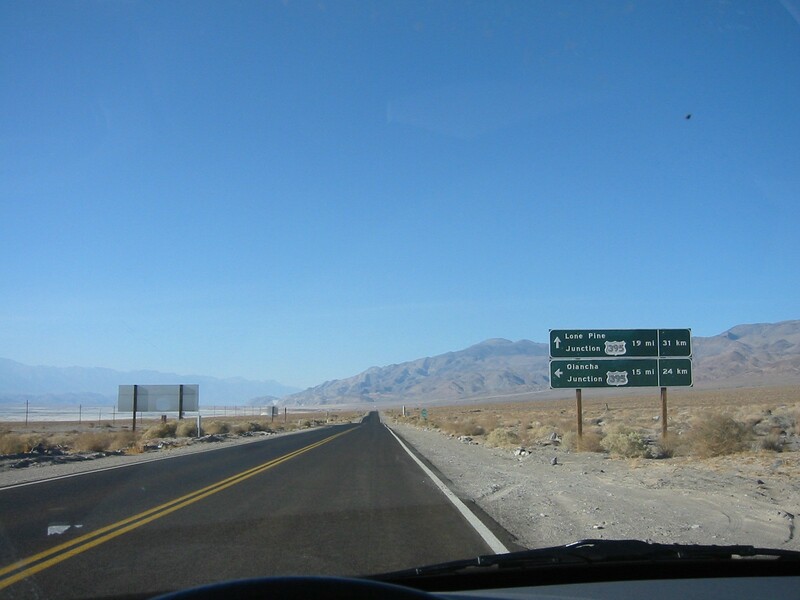 1) and past another to Panamint City (pop. 0). The view is stunning as I cross this flat plain skirted by mountains on every side, but by now I’m too nervous to enjoy it. I’ve moved from one extreme of imagination — an unreal optimism about what the desert is like — to the opposite extreme of being too afraid to stop and get out in case the car won’t start again or I am bitten by a rattle-snake. So I move into the only option left — pretend to be a machine, don’t think, don’t cry, just keep going until you get out of here. 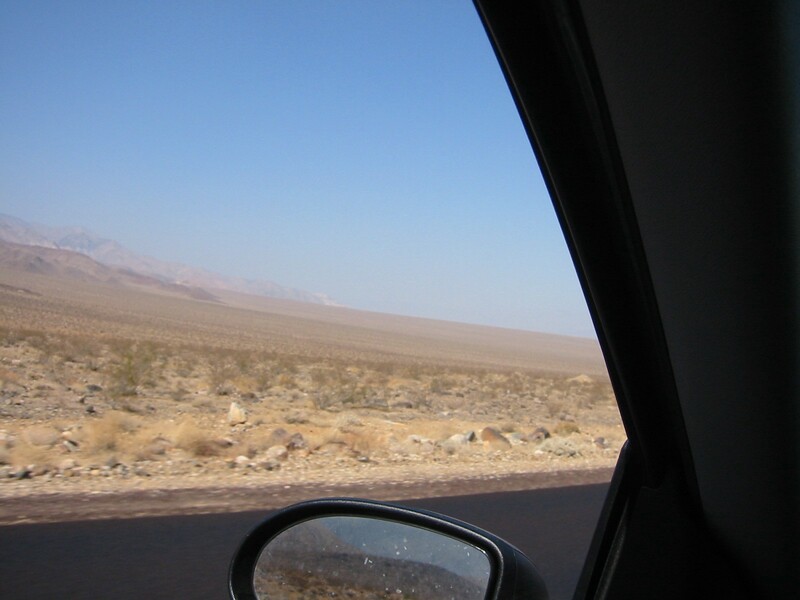 Panamint Desert, California, October, 2002. ‘Turn off air-con to save engine’. It’s October, so much less hot than in the high tourist season, but nevertheless that does it. Enough. I turn around and drive slowly back up the road I have just joined. 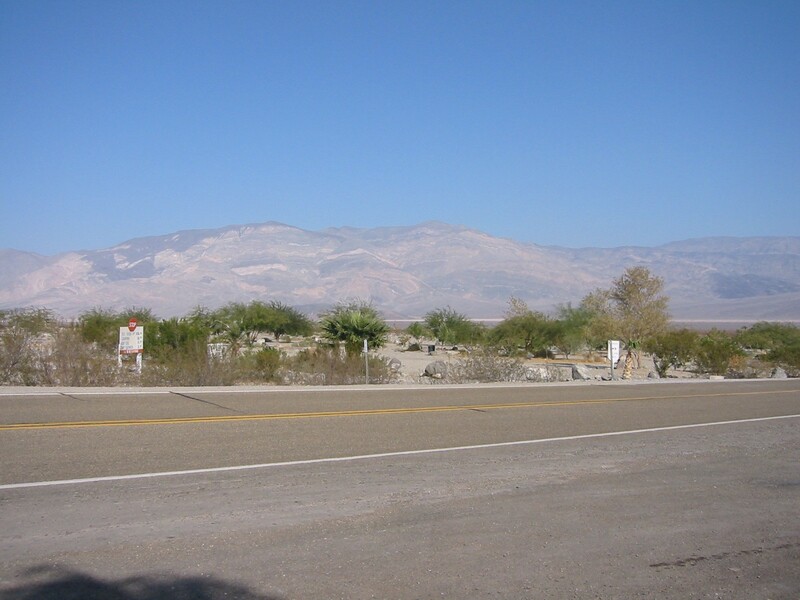 Within a mile, just around a corner, I find the Panamint Springs Resort. Civilisation! I park up with relief to consult my maps, drink iced tea, and ask the people there which is the best way to go. It turns out that I have three choices: return to Trona the way I have come, across the scary windy flats with the mountain pass at the end; go east on 190 to Death Valley, or go west on 190 and from there back to civilisation. I ask the bar-tender what the road to the west is like. ‘Hairy’ he says, ‘but not as hairy as Death Valley’. Hanging around on the veranda, avoiding making a decision, I browse the tourist notice board and read the warnings about driving safety. The most frequent car accidents in Death Valley, it says, are single car accidents caused by the driver not paying due care and attention. Does that include accidents caused by uncontrollably shaky knees, I wonder? Then on and on and on across the Mojave desert which is increasingly windy but at least I am on a proper road and eventually I drive back into the town of Mojave for gas. By now the wind has turned to a real sandstorm. I am wearing shorts and the sand whips hard across my bare legs when I get out to work the pump. Tumbleweed and sand blow everywhere. The sun is going down and the sky is pink but big clouds of sand keep blowing up and obscuring it in swathes of dark smoke. 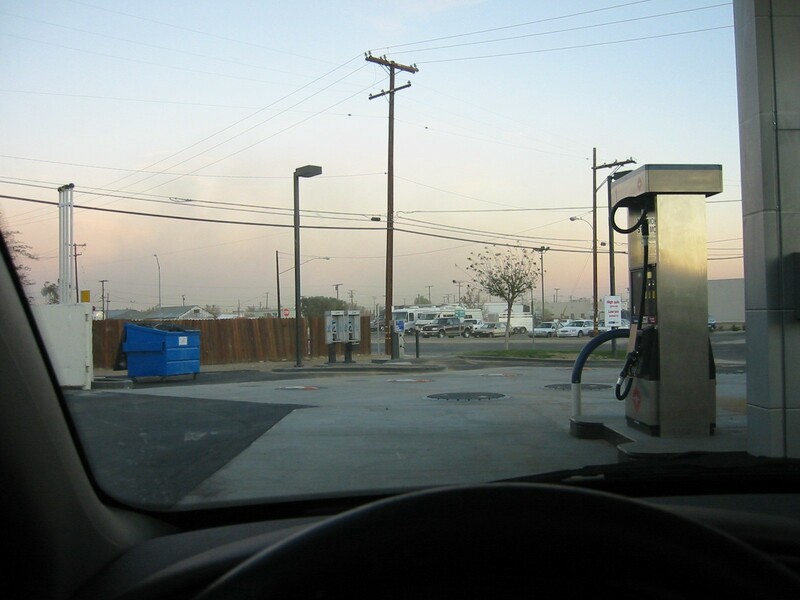 Dust storm in the Mojave Desert, October, 2002. At 5.30pm, ten hours since I was last there, I stop again at Palmdale, but this time at a different turn-off and a bigger mall. Now I feel very bonded to this strange town built out in the middle of nowhere. Suddenly it’s the best place in the world. I have dinner, my first proper meal of the day, and the plastic food tastes just wonderful. I eventually get back to Santa Monica just before 9pm. I’ve been driving for most of the day and the clock shows 480 miles — much of that at snail speeds due to hairpin bends, bad roads, and sand storms. I shower and, with huge relief, immerse myself in the pool. The lights are on high up there in the apartment blocks. 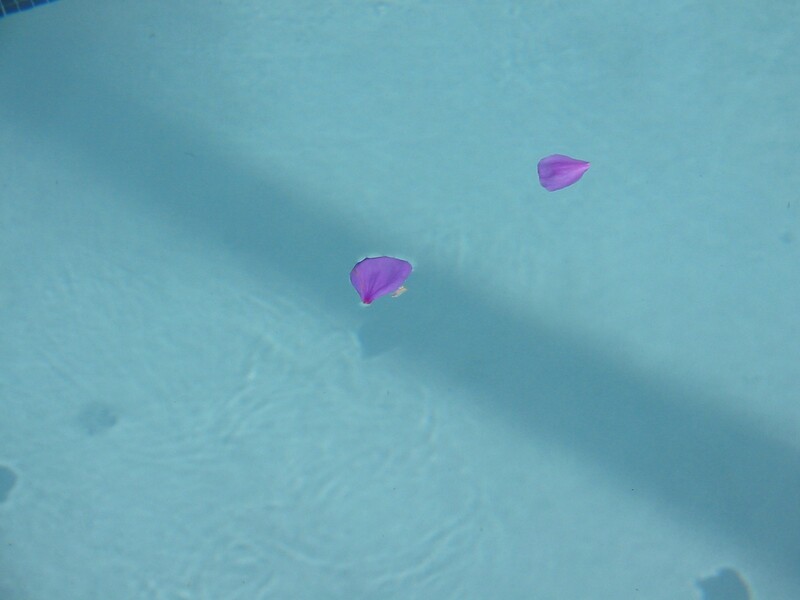 Petals settle on my arms as I swim. It’s so good to be back in Los Angeles. The next day, after a good night’s sleep and still rather shaken, I visit the camera obscura on Ocean Promenade, Santa Monica. It was built in 1889 and has been moved around a few times but still works as well as ever. The sun is really bright and the image on the round plate just incredible with razor-sharp colour. The people move around just like in a movie except this is real life action. I feel as if I am watching a film, not just the projected images of people a few hundred yards away on the beach. After the wide screen of the desert, the round reflector plate of the camera obscura is comfortingly confined and I’m strongly moved to take a picture of it even though I know perfectly well that my camera will automatically flash and the entire image will disappear. But I take the picture anyway, and the image does disappear, and so, as predicted, I have nothing to show for it. The picture looks just like a round blank table, which is what it is — there was never anything there in the first place. It’s not paint that has been washed off or developing inks that did not work — it was never there and it didn’t exist — except as a literal trick of the light. But when ~I~ look at the picture I can still see the image because it is lodged in my memory since I have that extra data source of having been there on that day. The image that you may have, on the other hand, and depending on whether you have also visited Santa Monica camera obscura at some time, is the imaginary image that you have conjured up to try to fit this story I am telling you, about what I actually saw in that darkened room and about the final image held in my digital camera. So what I see is different from what you see. Which is the true image? Neither and both. Ditto the desert, which also remains painfully inscribed behind my retinas. It has hit home hard that my expectations of the desert had been so completely and utterly naïve. Have I spent so long online that I’ve forgotten to anticipate physical fear? The terror I experienced was a brutal reminder that I am more than a mechanism for remembering and imagining, and that part of me is a finite body that can malfunction, fall off the sides of mountains, and get damaged. I’m shaken up, and frankly rather embarrassed. I just don’t seem to be able to stop trying to drag virtuality into the real. I’ve failed so far, but I’m certain I can find a reconciliation, some way to live in both places, some state of mind which allows me fluidity. I’m determined to keep looking. Excerpted from my 2004 memoir/travelogue of cyberspace ‘Hello World: Travels in Virtuality’, Raw Nerve Books. Postscript: The Hotel Del Capri was a much-loved old-style hotel just off Wilshire Bvd, Los Angeles. It closed down the year after my visit, perhaps after a serious fire which damaged much of the property, and is still missed by many. See my old blog post on the subject, and the comments below it.